I have a current source that can output different types of waveform depending on the input, including DC (Howland current pump). I need to find a solution as to make sure that when DC is not required it does not appear at the output. Basically here a series capacitor with the output of the circuit could give me that. It would allow to pass every waveform except for the DC one (when I need DC I could decouple that capacitor). The problem is that when I attach a resistor as being load my signals could be damaged. I use 1 Hz frequency, amplitudes from 1 V to let's say 50 Volts with mono and bipolar signals, saw-tooth, triangular signals. Do you think it helps to place a buffer between the capacitor and the resistor? This would look like a high pass filter, with cutoff at 1Hz. Browse other questions tagged dc or ask your own question. Can I power two linear DC regulators, each running a motor, from a single 12v source? 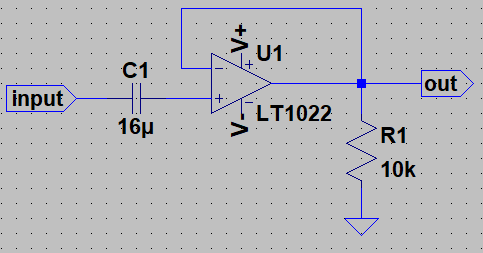 In an audio circuit, with an LM386 chip - how does the DC electric power and the AC audio work?